The 2013 spring and summer runways have been filled with bold patterns and bright colours. Schwarzkopf Professional has developed a new colour collection to celebrate the outrageous runway trends and transform them into fun, wearable hairstyles. 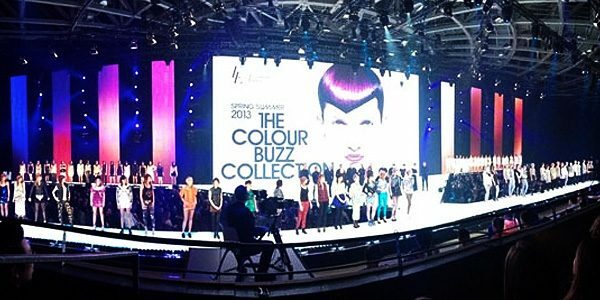 Introducing Schwarzkopf Professional Essential Looks Colour Buzz Collection! To celebrate the collection, Schwarzkopf held an exclusive fashion show and cocktail hour at The Warehouse at Downsview Park in Toronto. The night included a 3-hour show of singing, dancing and models displaying each Colour Buzz trend. Schwarzkopf’s artistic director Kathy Simon was there to explain the details of each look and celebrity Master Colourist Kim Vo was in attendance to discuss his new influence on Schwarzkopf’s blonde collection as well. Think super-modern, with bold straight cuts. The colouring for this look is minimal, with a heavy emphasis on exaggerated angles—and of course, white. This one is really fun! As the Schwarzkopf style guide puts it, “In this trend, the only use for a rule book it to tear it up.” Here you will see uneven haircuts, messy pixies and bright colours. Think big, glossy tousled hair. This trend puts an emphasis on luxury and seduction. The colours are blended flawlessly and the cuts are long, layered shapes. The ‘60s are back! Mono Mods introduces graphic influences and classic shapes back into the world of hair design. Think Twiggy, with an edge. Splashes of colour create a modern twist to this classic style. 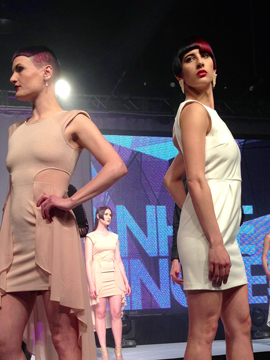 Each trend was modeled in four ways—long, mid-length, short and salon short. The salon short versions were the ones that grabbed the most attention from the audience. “We are here to show the Colour Buzz trends in an exaggerated way, to drill the styles into your minds and make it easier to recognize them when they appear watered down on the streets tomorrow,” explains Kathy Simon. Although some of the trends were styled in an outrageous way, each concept could easily work for an everyday look. In school or at work, there is definitely room for some funky colours and modern haircuts—it’s all in how you choose to rock it! Along side the hair models were singers, dancers, jugglers and a very flexible pair of gymnasts. All of this made for a fabulous—and educational—show, and a perfect build up for Kim Vo’s closing segment. Kim, who has coloured the blonde locks of Katherine Heigl, Kate Hudson, Dakota Fanning and Britney Spears (just to name a few) was there to show how Colour Buzz works for the coveted blonde bombshell. The blonde styles were extremely bright, and incorporated light subtle pops of colours to create a wearable, colourful blonde look. At the end of the night, I felt inspired and excited to see the Colour Buzz collection hit the streets. I might even sport a few splashes of colour on my own head this summer!